Many great tips and examples have been added to this great GCU Community Blog – this page just makes an easy reference for you to go explore and concur this unique creative experience. 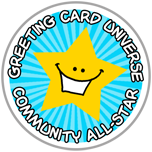 Creating cards using GCU’s Stock Card Creations (Bigstock) is a quick and easy way to create cards. The tool is fairly simple and has some limitations but with your creative ideas the possibilities are endless. Recently, I opened Exclusive Creations on GCU to showcase Big Stock creations of mine with my own verse/message, creative skills to combine stock image with well-placed, professional looking typography. Big stock creations, by nature, are exclusively sold on GCU. In other words, you can not take your card front from GCU and sell the card elsewhere … unless you choose to go license the image for commercial resale use and recreate it in your own design software, but I don’t find that a particularly smart move. Offering something exclusively draws customers, thus my offerings at Exclusive Creations. Each stock image, when viewed for consideration, has a number. When you choose a BS image to work with, WRITE that number down. This will allow you easy access to retrieve the image again, should you need to recreate the card due to a card front error. The search feature on this tool will allow you to enter the image number and retrieve for you. You can enter a hex code for the color of your text box by using a screen print copy function of your in-process card, pasting that copy into a ‘new’ file in your design software, then using the color picker tool in your software to choose a color that looks great with your image choice. You can not enter a hex code color for the background at this time. Watch that color background! Often times those stock images which appear to have a white background, actually are not true white. This can cause an odd looking separation between image and card area – even faint often looks unprofessional and can be a reason for decline. GO SLOW! Never rush to create a stock card at GCU. If you make a mistake of any kind on the card front, you can not fix it and resubmit. Card front mistakes are declined and you start over. Take your time. Triple check your work. READ, READ, READ all the tips below. And, when you get stuck or frustrated, go back and find the answer in the links on this page. Most likely, any and all questions which may arise regarding using this fun creative tool, are clearly spelled out in one of the following posts. There are several great articles here on the blog which help you work with Big Stock creations and each one is worth study if you want to become proficient. Images cannot be Returned for Edits. If Declined by a Reviewer, you will need to recreate the card – making the necessary edits – and resubmit. It’s worth nothing at this time that Reviewers cannot Return a Bigstock card for Edits! If there’s an error or a miscalculation in composition, or any other problem, they can only Decline the card. If you continue to have cards Declined due to repeated errors, GCU can revoke your use of the service. If repeated submissions are Declined based on lack of marketability, GCU can revoke your usage of the service. Bigstock images may be taken down if necessary. Content contributors on Bigstock can choose to not participate in their Partner Program. GCU cards created using a stock image that has been removed from the service will be Declined and the artist will be notified of this action. Thank you for your understanding. Cards undergo regular review, BUT will appear immediately in your Private gallery as they await review. If approved, the reviewer will move them to the public gallery. Don’t forget the same rules apply as for regular GCU card submissions.